“No Further Instructions,” a performance by Howard Fishman with New York Times travel journalist and photographer Michael Benanav, gets under way at 8-PM Friday in the Arthur Zankel Music Center at Skidmore College. Howard will also perform at the Hudson Opera House on the 2nd, at The Falcon on the 3rd. The program combines original music, historical memoir, storytelling and compelling photography to share the duo’s exploits and experiences as American Jews in rural Romania. 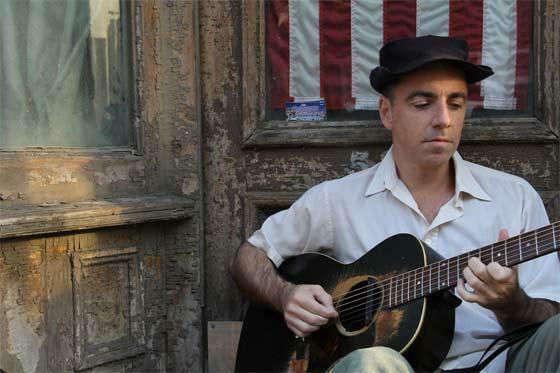 Fishman began his musical career on the streets of New Orleans and the subways of New York before landing his first major engagement at the Algonquin’s Oak Room in 1999. Since then he has headlined in a number of top venues in the U.S. and abroad, including Lincoln Center, the Steppenwolf Theatre and the Blue Note. Neil Rolnick, professor of music at Rensselaer Polytechnic Institute, will present a concert of music for violin, piano, and computer at 7:30 PM Wednesday night at EMPAC at Rensselaer in Troy. The concert features a selection of his most recent compositions from 2003 to the present. Rolnick’s program showcases solo and duo works (plus computer) he has written in the past decade, a departure from the works for large ensembles that have made up the bulk of his recent work. Born in Boston and raised in North Carolina, Livingston Taylor is the fourth child in the very musical family that includes Alex, James, Kate and Hugh. From Top 40 hits “I Will Be in Love with You” and “I’ll Come Running,” to “I Can Dream of You” and “Boatman,” both recorded by his brother James, Taylor’s creative output has continued unabated, creating well-crafted, introspective and original songs that have earned him listeners worldwide. Taylor’s musical knowledge has inspired a varied repertoire, and he is equally at home with a range of musical genres – folk, pop, gospel, jazz – and from upbeat storytelling to touching ballads. He will be performing Friday night at the College of Saint Rose in Albany on Friday night. The New York Times referred to Lucius’ music as “luscious, luminous, lilting lullabies” – that’s high praise (and a lot of alliteration) from The Grey Lady – and Paste Magazine says the rootsy female-driven dynamic is dangerously powerful. Born in Benin, Angélique Kidjo is a Grammy award-winning music recording artist deemed "Africa's premier diva" by Time and is the continent's most internationally celebrated female musical exponent. The BBC has included Angélique Kidjo in its list of the "African continent's 50 most iconic figures". The Guardian has listed her as one of their "Top 100 Most Inspiring Women in the World" and Angelique is the first woman to be listed among "The 40 Most Powerful Celebrities In Africa" by Forbes Magazine. Known for her dynamic and uplifting music, she has translated her distinctive work in the arts to that of philanthropy; by promoting education for girls in Africa through her foundation, Batonga and as a UNICEF Goodwill ambassador. Angélique Kidjo will perform at The Mahaiwe in Great Barrington, MA this Saturday, Feb. 23rd at 8pm.